Ashes of the Singularity Launch Week Extra: Bonus Scenario Now Available! Yesterday, we were excited to launch our biggest title of the year. Today, we are still excited, but for more reasons than just the release! Why are we so happy? You. Our fans are what make our success possible and the response to Ashes has been overwhelming. When you take the time to give us feedback, hop online during our “Fans vs Devs” event to play with us, or leave a review, it helps us continue to make games that you enjoy. 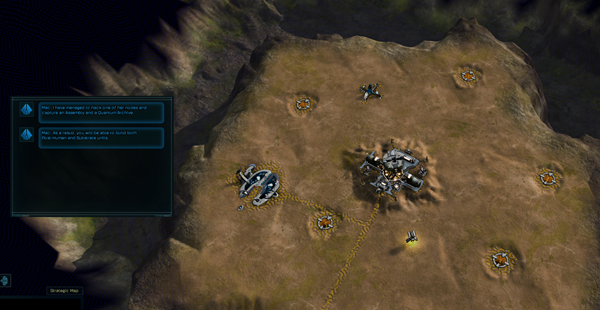 To say thank you, we’ve developed a new free scenario as a bonus for you. Check out the synopsis below and then boot up your game to give it a shot! Good luck! The Substrate overlord Athena has captured the world of Pithos and is seeking the planet's Turinium generator. You and your two allies must capture it first and put Athena out of commission. We have managed to hack one of Athena's assemblies allowing you to build both Post-Human and Substrate units at the same time! Get Ashes of the Singularity AND your Free Bonus Overlord Scenario today! Nice keep those Scenarios coming, and i will love to have to kind of tutorial on how to make Scenarios, can you guys release a step by step explanation? 2nd half of this guide may help ya. "You can build both PHC and Substrate units"
Welp, now THAT is gonna be interesting haha.